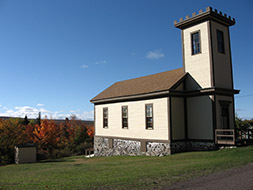 Religion had come to the Keweenaw before the arrival of the first copper miners. Both the Catholic and Methodist churches had sent missionaries to the Keweenaw to serve the Native Americans in the region. As mines opened these missionaries also began to serve the needs of the miners in the region. Reverend Bishop Baraga, then a mission priest, appeared on his snowshoes at Eagle River on January 11, 1847, well before Central was formed. Later Reverend H. L. Thiele and other priests served Central from their home church at Eagle Harbor. The Central Mining Company allowed the Catholics to use one of their buildings as a church for over 30 years, until it burned down in 1903. However Central was predominately a Cornish town and the Cornish were Methodist, not Catholic. The Methodists had established a mission at L’Anse as early as 1832 and quickly moved to serve the needs of the new mining towns. By 1864 the Sunday school of the Central Mine Methodist Church reported that it was serving almost 100 individuals. 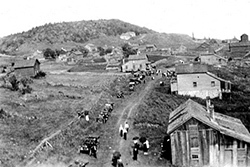 As the town of Central grew more and more families arrived. Starting in 1868 the Company and the Methodist Church at Central began a cooperative effort to construct a church at Central to house the ever growing Methodist Congregation. The project cost $2,000 with the company providing building materials and supervisions and the church members doing the actual construction. When it opened in 1869 it looked much as a Cornish Church would have appeared in Cornwall, except that the stone battlements at the top of a true Cornish Church were replaced by wooden imitations at Central. Alfred Nicholls later fondly described the church and its services: “Long before the appointed hour every seat was occupied. Even chairs had to be placed in the aisles to accommodate the worshippers. Almost everybody went to church and in many cases it was their only vacation or recreation from life’s daily routine…A single aisle divided the men from the women, as the sheep from the goats. On the right side were the men… on the left sat the women.”. It wasn’t long before the church basement was used for classrooms as the old school at the Northwestern mine was full and the new Central School (hyperlink) had not been completed. The Methodist Church had an average attendance of 203 during 1886 with the lowest attendance of 182. The Sunday School had an enrollment of 304 including adults, children, teachers , etc. On Sunday the church would host classes at 9:00AM, worship services at 10:30, Sunday school at 2:30, and evening worship at 6:00 PM. Prayer meetings were held on Wednesday and Saturday evenings, with the Saturday meeting for miners who worked the night shift and were unable to attend the Wednesday night service but were not working on Saturday night as the mine was closed. But the rich copper deposits below Central ran out as the mine went deeper. By 1894 all production was stopped while some men were kept on to explore for new deposits. With no work to support them the families began to leave and churches began to shrink. The Methodist Keweenaw Missions sent the last minister to Central, Reverend A. O. Hammond, in 1903 and then later closed the church. The remaining Methodists of Central worshiped elsewhere. Not only people left Central, but the bell of the closed Methodist Church was moved to the church in Mohawk where it still rings today. After a fire in 1903 destroyed the Catholic Church the congregation was given use of another building across from the old church. However, in what must have seemed as a sign from above, the new church building was blown off of its wooden foundation in a gale in 1904. 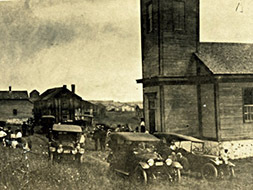 The building was quickly set back on its posts but the congregation dwindled and soon worshiped over the bluff at Eagle Harbor. With the mine closed and buildings shuttered Central now stood as an empty symbol of the past. However, when the Keweenaw Central Railroad began running trains from Calumet to Mandan, a town north of Central and south of Copper Harbor, it sparked an idea that has helped to promote the spirit of Central. Alfred Nicholls, the former principal of the Central School was then working for the Osceola Schools near Calumet rode the train to Mandan and had an idea as he passed Central. He contacted other Central Men such as Calumet Public School Superintendent Edward J. Hall, and Thomas E. Mitchell of Trimountain (A mining town south of Houghton). They made plans to use the train for an excursion to Central to have a reunion on July 21, 1907. They planned to re-open the old church and have a Church Service as part of the event. The reunion was an immediate hit. Families brought picnic lunches and walked about the town telling tales of what it was like to live in Central. They left by train in the afternoon and began making plans for another reunion to be held the next year. A tradition was born. 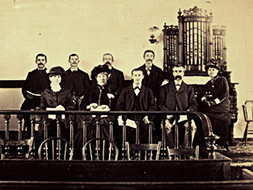 An “Executive Committee” was formed that organized the reunions until a more formal “Board of Directors of the Central Mine M. E. Church” was formed 1995. It continues today to organize the annual reunion and restore the church building and grounds. The last Sunday of July became the date of the annual Central Reunion. But where as some reunions fade as the members of the group pass on, this reunion has continued for over 100 years. The bell that peals across the valley today is actually the school bell from the neighboring Cliff Mine which was installed at Central during the centennial of the church in 1968. Now, over 100 years after the first Central Reunion, the event has become a summer pilgrimage participated in by the children, grand children, and even great-grandchildren of those early Central residents. For one day a year the town of Central again echoes with the noise of children and adults. And there is still a town to walk around. The Keweenaw County Historical Society has purchased several of the buildings in town. One has become a visitor center, another a museum, and others are being restored. The Society has several projects underway to preserve and interpret life in Central. Their efforts, combined with those of the Church Board, provide hope that Central, while a mere shadow of her glory days, will never become a true ghost town. The Executive Board of the Central Mine Methodist Church invites everyone to come to the annual Central Reunion which is held each year on the 4th Sunday in July. Why not take some time and visit their website for additional information about the Central Church and the Central Reunion.